Last week we received half of our house hold goods. Yes, just half. Apparently it didn't all fit in the barge but that's OK. It's something. I was really excited to find our favorite family video game, the Wii. Since buying this latest electronic gadget, two years ago, I've become somewhat fond of video games. I was never a fan of the idea that one could sit in the same position, moving nothing but a few fingers and thumbs for hours at a time. I just can't focus that long. However, the Wii was a different story. We played tennis, bowling, boxing and many other games that took us from the couch to the middle of the family room floor fast. So I added the Wii Board and that's when things really picked up around here. When I tell you that even my 3 year old gets involved in the fitness activities, I'm not lying. We are very competitive with each other so every time someone's score beats the last player, well, we have to take care of that now don't we? One of my favorite activities is the hoola hoop. Have you done the hula? We were soakin' wet with sweat and we were having a blast. Next came boxing. I was beat by my seven year old twice but I took her down on the third try - although, she says she let me win because she felt sorry for me, HA!! We finished our workout, I mean, our game with a few yoga poses. It was one of the best family game nights we've had and we're about ready to do it again real soon. The next day we, or I, felt the pain of our game night. My obliques were screaming and my arms were super sore from boxing. I can honestly say we had a hard workout, we had a great time, and there was no couch time. We will be repeating the event soon. Our Wii board arrived in our shipment this week and we can't wait to get it set up and begin the battle yet again. 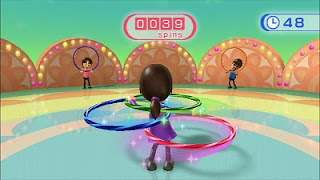 I need to practice my hula so I can beat little miss know it all here... hee hee hee! If you haven't already tried it, go for it. Be a kid again, you will have an amazing time, trust me! !